I would like to thank all of those people who donated to the ASPCA's 5K fund raising event and to my personal efforts in the ASPCA 5K event. 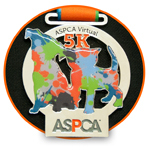 The funds you donated will help to raise awareness and the much needed funding to support the ASPCA's programs. Today I participated in a 5K and I am happy to announce that I did in fact turn in a time that was a personal best for me and surpassed all of my times for the past year and 3 months of training, I believe this was accomplished as a result of your generous donations and the support you gave me. There were several anonymous donations to my page for the ASPCA 5K event. This message of thanks goes to all of you that are named and those of you who chose to remain anonymous. A heartfelt thank you! !